SALT LAKE CITY, Utah – HARMAN’s DigiTech today announced the introduction of its Red Coral Dual Detune e-pedal for its iStomp programmable pedal. The Red Coral adds a choice of one or two slightly pitch-shifted signals to the original, to “double” or beef up the sound of a guitar, bass, keyboard or other instruments. The DigiTech Red Coral offers a detuning effect that’s similar to a chorus pedal in that it adds a pitch-shifted signal to the original. However, the pitch shift doesn’t modulate like the regular slow or fast cycling of a chorus pedal – the amount of pitch shift stays the same. The resulting effect sounds like two guitarists playing at the same time. 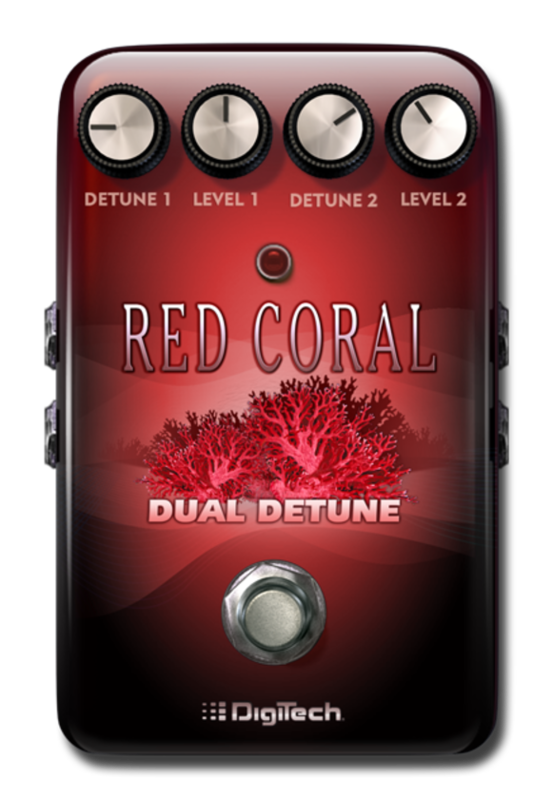 The Red Coral Dual Detune offers two independent voices each capable of plus or minus 24 cents of pitch shift, to produce anything from extremely subtle to lush detuning and double tracking effects. Each of the voices has an independent level control so that when the pedal is used in stereo one channel can be detuned while the other channel remains unaffected. The DigiTech Red Coral Dual Detune e-pedal will be available in November 2012 at an introductory price of $0.99. This introductory price will run for one month. After the introductory period the price will change to $6.99.